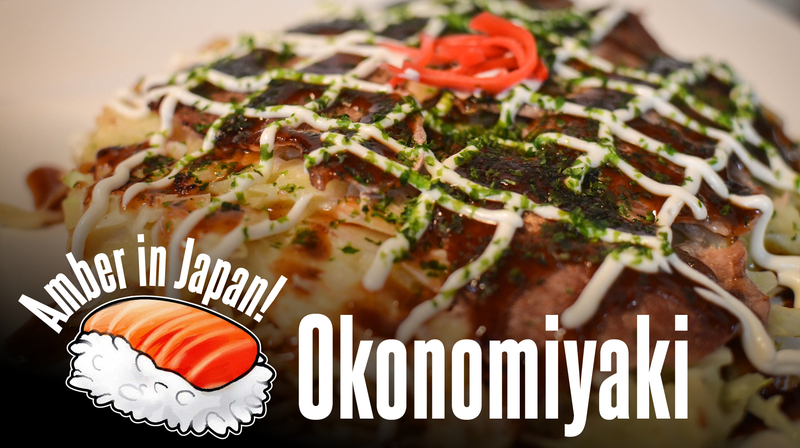 Okonomiyaki is a savory Japanese pancake topped with meat and a variety of delicious condiments. It’s a mix of great flavors and textures that meld together perfectly. It’s super popular in Japan, and if you give it a try you will understand why. Okonomi translates to “as you like,” and different regions of Japan have their own styles of this dish (and every family has its favorite). This is my nana’s version—if you ask me, hers is the best! This recipe calls for grated Japanese yam. It’s a small amount, but don’t be tempted to leave it out. It makes the pancakes extra fluffy and delicious. If your broth or dashi is in powdered form, make the 1/2 cup/120 ml of broth according to the package instructions. Combine the broth, flour, yam, baking soda, and salt in a bowl and mix. Let it sit in the fridge for an hour or more. While the batter is in the fridge, prepare the yakisoba noodles for the yakisoba. Break up the noodles by soaking in hot (not boiling) water for 1 minute, pulling apart with a fork or chopsticks. Drain immediately. Take the batter out of the fridge and add shredded cabbage, egg, and shrimp, if using, and mix. Heat a nonstick 12-inch/35.5 cm skillet over medium-high heat and grease with a teaspoon of grape-seed oil. Alternatively, you can use an electric griddle at the dining table, and have your guests make the pancakes as they eat. Place about 1/3 of the package of the yakisoba noodles in the skillet and sauté with about a tablespoon of tonkatsu sauce. Once heated through, transfer the noodles to a plate, wipe out the skillet, and pour a ladleful of batter onto the skillet and flatten into a pancake 6 to 8 inches/15 to 20.5 cm in diameter. Place a pot lid over the batter to help it cook through. This will take about 4 minutes. Remove the lid, and lay slices of thinly sliced pork on top of the pancake. Flip the okonomiyaki and cook the pork until browned, 2 to 3 minutes. 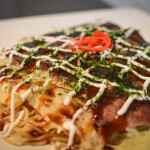 With a spatula, flip the okonomiyaki onto the plate on top of the yakisoba, so that the browned pork is face up. Let your guests top the okonomiyaki with tonkatsu sauce, mayonnaise, aonori, and other condiments. Enjoy!